What share of US manufacturing firms export? What share of US manufacturing firms export? That’s a simple question. But my answer recently changed by quite a lot. While updating one of my class slides that is titled “very few firms export”, I noticed a pretty stark contrast between the old and new statistics I was displaying. In the table below, the 2002 numbers are from Table 2 of Bernard, Jensen, Redding, and Schott (JEP 2007), which reports that 18% of US manufacturing firms were exporters in 2002. The 2007 numbers are from Table 1 of Bernard, Jensen, Redding, and Schott (JEL 2018), which reports that 35% of US manufacturing firms were exporters in 2007. This is a bit of an understatement: only about half of firms that export in customs records say that they export when asked about it in the Census of Manufactures! [This comparison is inexact because the share of exporting firms may have really increased from 2002 to 2007, but BJRS (2018) say that they “find a relatively similar pattern of results for 2007 as for 2002” when they use the CM question for both years.] The typical three-digit NAICS industry has the share of firms that export roughly double when using customs data rather than the Census of Manufactures survey response. Who knows what happened in “Miscellaneous Manufacturing” (NAICS 339), which had 2% in the 2002 CM and 35% in the 2007 LFTTD. I presume that the customs records are more reliable than the CM question. More firms are exporters than I previously thought! This entry was posted in Firms, Measures, Statistics & Technicalities on 11 November 2018 by jdingel. This post is about “hat algebra” in international trade theory. Non-economists won’t find it interesting. a given proportional change in commodity prices gives rise to a greater proportional change in factor prices, such that one factor price unambiguously rises and the other falls relative to both commodity prices… the changes in the unit cost and hence in the price of each commodity must be a weighted average of the changes in the two factor prices (where the weights are the distributive shares of the two factors in the sector concerned and a circumflex denotes a proportional change)… Since each commodity price change is bounded by the changes in both factor prices, the Stolper-Samuelson theorem follows immediately. I’m not sure when “hat algebra” entered the lexicon, but by 1983 Brecher and Feenstra were writing “Eq. (20) may be obtained directly from the familiar ‘hat’ algebra of Jones (1965)”. What is “exact hat algebra”? Rather than estimating such a model in terms of levels, we specify the model in terms of changes from the current equilibrium. This approach allows us to calibrate the model from existing data on production and trade shares. We thereby finesse having to assemble proxies for bilateral resistance (for example, distance, common language, etc.) or inferring parameters of technology. Here’s a simple example of the approach. Let’s do a trade-cost counterfactual in an Armington model with labor endowment , productivity shifter , trade costs , and trade elasticity . The endogenous variables are wage , income , and trade flows . The two relevant equations are the market-clearing condition and the gravity equation. Suppose trade costs change from to , a shock . By assumption, . We’ll solve for the endogenous variables and . Define “sales shares” by . Algebraic manipulations deliver a “hat form” of the market-clearing condition. Similarly, let’s obtain “”hat form” of the gravity equation. If we use data to pin down , and , then we can feed in trade-cost shocks and solve for to compute the predicted responses of . We refer to this approach popularized by Dekle et al. (2008) as “exact hat algebra.”… One can think of this approach as an “exact” version of Jones’s hat algebra for reasons that will be clear in a moment. What is “calibrated share form”? Dekle, Eaton, and Kortum (AERPP 2007, p.353-354; IMF Staff Papers 2008, p.522-527) derive the “exact hat algebra” results without reference to any prior work. Presumably, Dekle, Eaton, and Kortum independently derived their approach without realizing a connection to techniques used previously in the computable general equilibrium (CGE) literature. The CGE folks call it “calibrated share form”, as noted by Ralph Ossa and Dave Donaldson. Rutherford shows that the CES production function can be calibrated relative to a benchmark with output , capital , and labor as , where is the capital share of factor income. If we introduce “hat notation” with , we get . Similar manipulations of the rest of the equations in the model delivers a means of computing counterfactuals in the CGE setting. This entry was posted in Measures, Statistics & Technicalities on 7 May 2018 by jdingel. What economic activities are “tradable”? I’ve had a couple conversations with graduate students in recent months about classifying industries or occupations by their tradability, so here’s a blog post reviewing some of the relevant literature. A number of papers emphasize predictions that differ for tradable and non-tradable activities. Perhaps the most famous is Atif Mian and Amir Sufi’s Econometrica article showing that counties with a larger decline in housing net worth experienced a larger decline in non-tradable employment. We might also want to speak to the tradability of various occupations. Ariel Burstein, Gordon Hanson, Lin Tian, and Jonathan Vogel’s recent paper on the labor-market consequences of immigration varying with occupations’ tradability is a nice example. They use “the Blinder and Krueger (2013) measure of `offshorability’, which is based on professional coders’ assessments of the ease with which each occupation could be offshored” (p.20). When they look at industries (Appendix G), they use an approach similar to that of Mian and Sufi. Are there other measure of tradability in the literature? This entry was posted in Measures, Statistics & Technicalities, Trade costs on 6 January 2018 by jdingel. Robert Manduca, a Harvard sociology PhD student, has put together a nice visualization of employment data that he titled “Where Are the Jobs?” It’s a great map, modeled after the very popular dot map of US residents by ethnicity. The underlying data come from the Longitudinal Employer-Household Dynamics (LEHD) program, which is a fantastic resource for economics researchers. Since every job is represented by a distinct dot, it’s very tempting to zoom in and look at the micro detail of the employment geography. Vox’s Matt Yglesias explored the map by highlighting and contrasting places like Chicago and Silicon Valley. Emily Badger similarly marveled at the incredible detail. A primary objective of the QWI is to provide employment, job and worker flows, and wage measures at a very detailed levels of geography (place-of-work) and industry. The structure of the administrative data received by LEHD from state partners, however, poses a challenge to achieving this goal. QWI measures are primarily based on the processing of UI wage records which report, with the exception of Minnesota, only the employing employer (SEIN) of workers… However, approximately 30 to 40 percent of state-level employment is concentrated in employers that operate more than one establishment in that state. For these multi-unit employers, the SEIN on workers’ wage records identifies the employing employer in the ES-202 data, but not the employing establishment… In order to impute establishment-level characteristics to job histories of multi-unit employers, non-ignorable missing data model with multiple imputation was developed. These are challenging data constraints. I have little idea how to evaluate the imputation procedures. These things are necessarily imperfect. Let me just mention one outlier as a way of illustrating some limitations of the data underlying the dots. Census block 360470009001004 (that’s a FIPS code; “36” is New York “36047” is Kings County, and so forth) is in Brooklyn, between Court St and Adams St and between Livingston St and Joralemon St. The Borough Hall metro station is on the northern edge of the block. (Find it on the Census Block maps here). 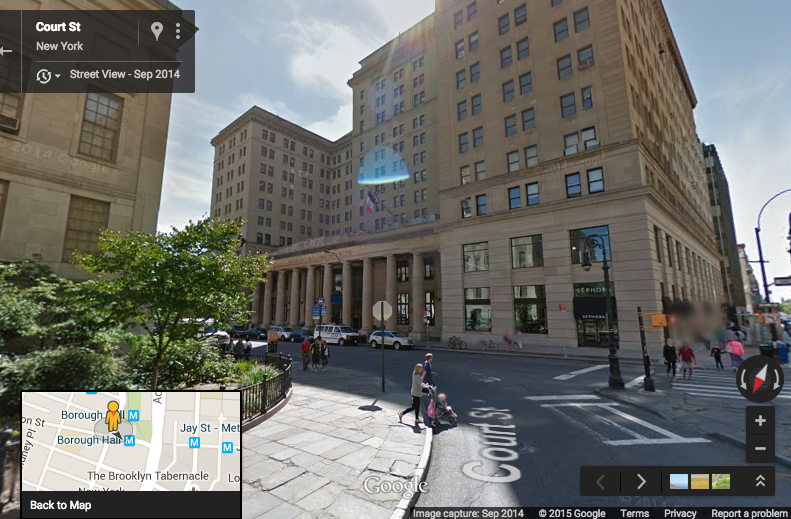 A glance at Google Maps shows that this block is home to the Brooklyn Municipal Building, Brooklyn Law School, and a couple other buildings. What’s special about census block 360470009001004 is that it supposedly hosted 174,000 jobs in 2010, according to the LEHD Origin-Destination Employment Statistics (ny_wac_S000_JT01_2010.csv). This caught my eye because it’s the highest level in New York and really, really high. The other ten census blocks contained in the same census tract (36047000900) have less than 15,000 jobs collectively. This would be a startling geographic discontinuity in employment density. The census block with the second highest level of employment in the entire state of New York has only 48,431 employees. A glance at the Brooklyn Municipal Building shows that it’s big, but it sure doesn’t make it look like a place with 174,000 employees. And other data sources that do report employment levels by establishment (rather than state employer identification number) show that there aren’t 174,000 jobs on this block. County Business Patterns, a data set that is gathered at the establishment level, reports that total paid employment in March 2010 in ZIP code 11201, which contains this census block and many others, was only 52,261. Looking at industries, the LODES data report that 171,000 of the block’s 174,000 jobs in 2010 were in NAICS sector 61 (educational services). Meanwhile, County Business Patterns shows only 28,117 paid employees in NAICS 61 for all of Brooklyn (Kings County) in 2010. I don’t know the details of how the state UI records were reported or the geographic assignments were imputed, but clearly many jobs are being assigned to this census block, far more than could plausibly be actually at this geographic location. So you need to be careful when you zoom in. Robert Manduca’s map happens to not be too bad in this regard, because he limits the geographic resolution such that you can’t really get down to the block level. 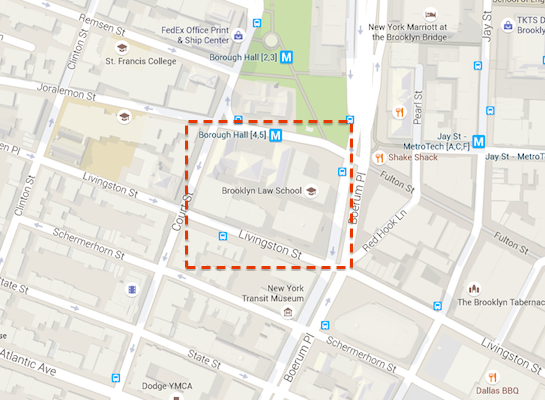 If you look carefully at the image at the top of this post and orient yourself using the second image, you can spot the cluster of “healthcare, education, and government” jobs on this block near Borough Hall just below Columbus Park and Cadman Plaza Park, which are jobless areas. But with 171,000 dots on such a tiny area, it’s totally saturated, and its nature as a massive outlier isn’t really visible. In more sparsely populated parts of the country, where census blocks are physically larger areas, these sorts of problems might be visually evident. 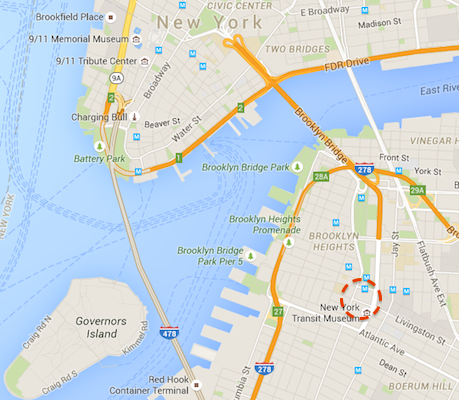 “Where Are The Jobs?” is an awesome mapping effort. It reveals lots of interesting information; it is indeed “fascinating” and contains “incredible detail“. We can learn a lot from it. The caveat is that the underlying data, like every other data source on earth, have some assumptions and shortcomings that make them imperfect when you look very, very closely. P.S. That second-highest-employment block in New York state? It’s 360470011001002, across the street from the block in question. With 45,199 jobs in NAICS sector 48-49, Transportation and Warehousing. But all of Kings County reported only 18,228 employees in NAICS 48 in 2010 in the County Business Patterns data. This entry was posted in Economic geography, Measures, Statistics & Technicalities on 31 July 2015 by jdingel. The Cato Institute’s Randal O’Toole claims to debunk a recent paper suggesting a “fundamental of road congestion”. In support of the induced-demand claim, Mann cites research by economists Matthew Turner of the University of Toronto and Gilles Duranton of the University of Pennsylvania. “We found that there’s this perfect one-to-one relationship,” Mann quotes Turner as saying. Mann describes this relationship as, “If a city had increased its road capacity by 10 percent between 1980 and 1990, then the amount of driving in that city went up by 10 percent. If the amount of roads in the same city then went up by 11 percent between 1990 and 2000, the total number of miles driven also went up by 11 percent. It’s like the two figures were moving in perfect lockstep, changing at the same exact rate.” If this were true, then building more roads doesn’t make traffic worse, as the Wired headline claims; it just won’t make it any better. However, this is simply not true. Nor is it what Duranton & Turner’s paper actually said. The paper compared daily kilometers of interstate highway driving with lane kilometers of interstates in the urbanized portions of 228 metropolitan areas. In the average metropolitan area, it found that between 1983 and 1993 lane miles grew by 32 percent while driving grew by 77 percent. Between 1993 and 2003, lane miles grew by 18 percent, and driving grew by 46 percent. My prior belief is that results published in the American Economic Review are unlikely to be debunked by a couple of paragraphs in a blog post. In this case, it’s fairly straightforward to explain why the average growth rates of lane kilometers and vehicle-kilometers traveled are not informative about the elasticity. 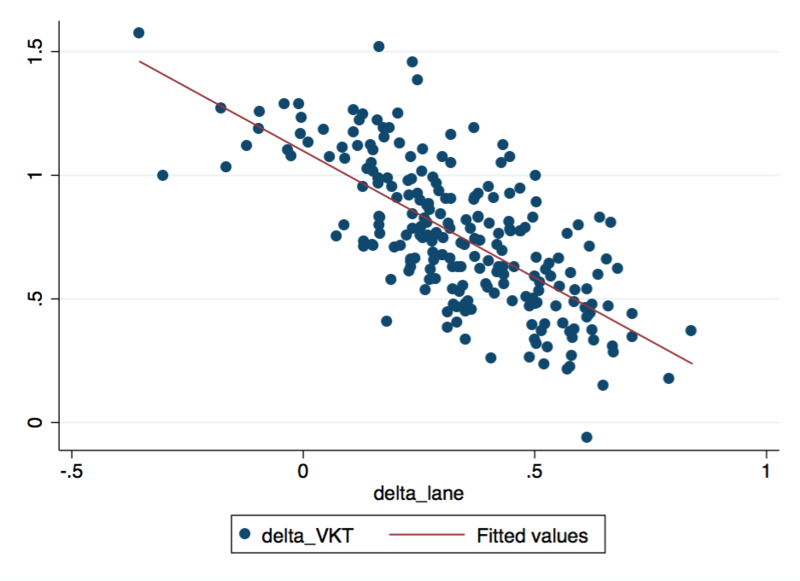 The lane-kilometer elasticity of VKT describes how changes in VKT relate to changes in lane kilometers. O’Toole tries to say something about this relationship by noting the average value of each. But describing the average growth rates does not say whether cities that experienced faster growth in lane kilometers also experienced faster growth in vehicle-kilometers traveled. It’s entirely possible for both averages to be positive and the elasticity relating them to be negative! Here are a few lines of Stata code to generate an example in which the averages are 32% and 77%, while the elasticity is -1. Having made this econometric point, one can grab the data used in the Duranton and Turner paper to note the average values and appropriately estimate the elasticity, revealing no contradiction whatsoever between these two moments. 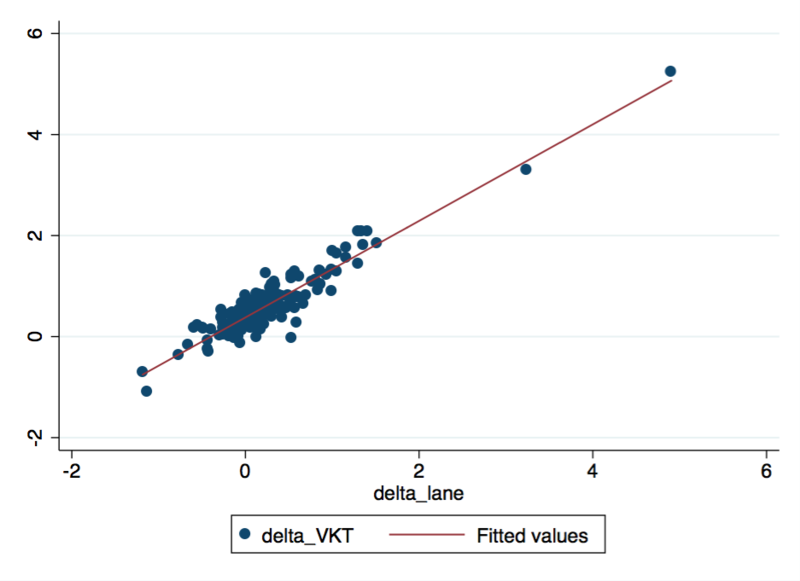 Across MSAs, the average VKT change was a 61 log-point increase, while the average lane kilometers change was a 25 log-point increase. That’s a ratio greater than two, but the estimated elasticity is 0.955. Hence Matt saying that he and Gilles found a one-to-one relationship. Their paper deals with various types of roads and instrumenting to infer the causal relationship, but I don’t need to describe those issues here. I’ve written enough to demonstrate why O’Toole’s blog post does not debunk the Duranton-Turner findings. This entry was posted in Measures, Statistics & Technicalities on 29 June 2014 by jdingel. [T]he simpler formulas that do not use information on sectoral trade volumes understate the true gains from trade dramatically, often by more than two-thirds. The error in the formulas across countries is strongly negatively correlated to the strength of Ricardian comparative advantage: the one-sector formula-implied gains understate the true gains from trade by more in countries with greater dispersion in sectoral productivity. The model-based exercise thus reinforces the main result of the paper that accounting for sectoral heterogeneity in productivity is essential for a reliable assessment of the gains from trade. This entry was posted in Comparative advantage, Measures, Statistics & Technicalities on 18 November 2013 by jdingel. In Melitz and Redding (2013b), we show that firm-level responses to trade that generate higher productivity do in fact represent a new source of gains from trade. We start with a model with heterogeneous firms, then compare it to a variant where we eliminate firm differences in productivity while keeping overall industry productivity constant. We also keep all other model parameters (such as those governing trade costs and demand conditions) constant. This ‘straw man’ model has no reallocations across firms as a result of trade and hence features no productivity response to trade. Yet it is constructed so as to deliver the same welfare prior to trade liberalisation. We then show that, for any given reduction in trade costs, the model with firm heterogeneity generates higher aggregate welfare gains from trade because it features an additional adjustment margin (the productivity response to trade via reallocations). We also show that these differences are quantitatively substantial, representing up to a few percentage points of GDP. We thus conclude that firm-level responses to trade and the associated productivity changes have important consequences for the aggregate welfare gains from trade. How can these findings be reconciled with the results obtained by Arkolakis, Costinot, and Rodriguez-Clare (2012)? Their approach compares models that are calibrated to deliver the same domestic trade share and trade elasticity (the sensitivity of aggregate trade to changes in trade costs). In so doing, this approach implicitly makes different assumptions about demand and trade costs conditions across the models that are under comparison (Simonovska and Waugh 2012). By assuming different levels of product differentiation across the models, and assuming different levels of trade costs, it is possible to have the different models predict the same gains from trade – even though they feature different firm-level responses. In contrast, our approach keeps all these ‘structural’ demand and cost conditions constant, and changes only the degree of firm heterogeneity (Melitz and Redding 2013b). This leads to different predictions for the welfare gains from trade. One potential criticism of our approach is that one can estimate the trade elasticity (the sensitivity of aggregate trade to changes in trade costs) using aggregate trade data only – without requiring any specific assumptions about the firm-level responses to trade. Whatever assumptions are made about those firm-level responses (and the demand and trade-cost conditions), they should then be constructed so as to match that estimated aggregate elasticity. However, recent empirical work has shown that those underlying assumptions radically affect the measurement of the aggregate trade elasticity, and that this trade elasticity varies widely across sectors, countries, and the nature of the change in trade costs (see for example Helpman et al. 2008, Ossa 2012, and Simonovska and Waugh 2012). There is thus no single empirical trade-elasticity parameter that can be held constant across those different models. Given the lack of a touchstone set of elasticities, we favour our approach to measuring the gains from trade arising from different models; one that maintains the same assumptions about demand and trade costs conditions across those models. This entry was posted in Firms, Measures, Statistics & Technicalities, Theory on 6 June 2013 by jdingel.